Villa Marie was one of the most beautiful hotels I have ever stayed at. The rooms were spacious and the hotel felt like a French chateau with gorgeous landscaping. There was so much character inside and out of the charming hotel. Staying here is a must. Unfortunately, my memory card snapped and I lost a ton of photos of the property and other scenery, however you can check out their website here for more information: Villa Marie Saint Tropez. I already am counting down the days until I can go back! 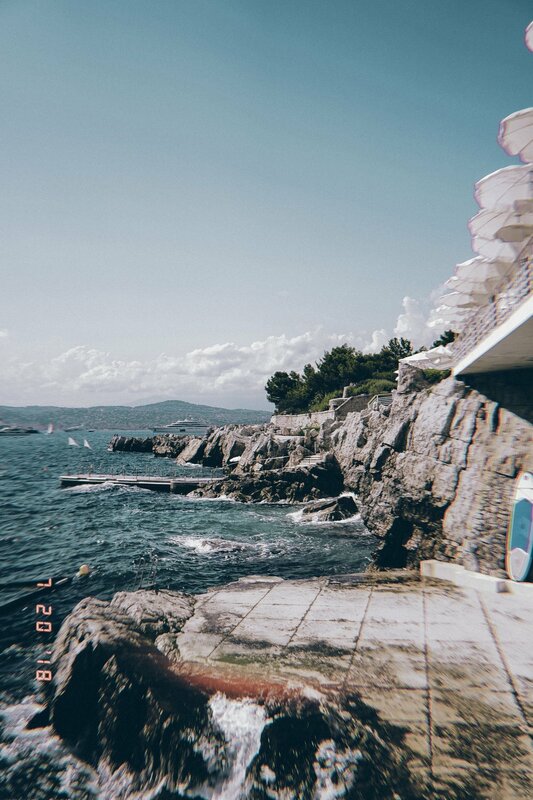 On the last day, Samantha and I went to our friend Lorna's beautiful home in Antibes and then went to Hotel du Cap-Eden-Rocin the Cap d'Antibes, for lunch along the and to swim (and of course for a photo!). The food was expensive but good and worth the experience. 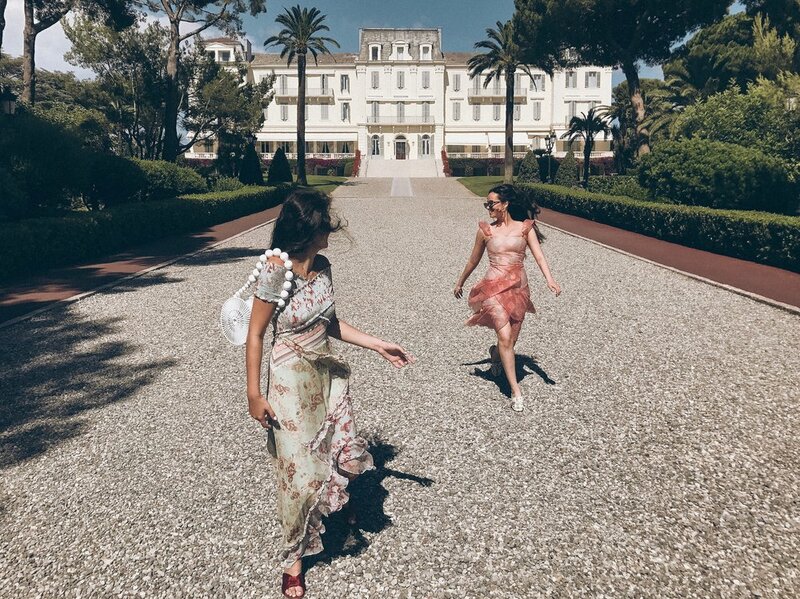 Also, in order to swim at Hotel du Cap you have to be a guest, luckily Lorna's friend was a guest so we were able to swim, but be sure to remember that before you go because they won't let you into the pool/ocean area if you cannot show that you are staying at the hotel. Most people go out at Hotel Byblos literally every night night because of their famous club, Les Caves du Roy downstairs. It's a ton of fun with great music and a dance floor which gets very crowded. Day parties are also a big thing in Saint Tropez. I went to Club 55 for lunch, and then went to Bagatelle Beach after which was basically a big party on the beach. Nikki Beach was also a must visit just because it's so famous. The food was decent but the atmosphere was fun! It was definitely a scene. Walk into town and walk around to the Chanel Store and Dior Store they are so beautiful and have so much character. You can even go for coffee at the Dior Store at their cafe. When you are walking through town there are some fun vintage stores that have great stuff in them as well as art shops and even cute homeware stores. They also have souvenir shops and local food to go. I got a Nutella baguette and did not regret a second of it. Uber works there although they sometimes will take a while. Many hotels also have shuttles which are great because you don't need to pay for €40 taxis to go 15 minutes. Worst comes to worst, you can always request for a hotel or restaurant to call you a taxi but be prepared to pray a pretty penny for your ride. It's expensive. Do not travel here if you are on a budget. People are way nicer in Saint Tropez than in Paris. You should try to speak a little French, the French people really appreciate the effort. Have plenty of Euros with you because ATM's/Cash Points are quite inconvenient and not everywhere accepts credit card. The city of Saint Tropez is a 2 hour drive from the Nice Airport.